Thanks again to our great friend CNCRoi.com, from St Catherines, in Ontario, Canada who always allows us to replicate his content. Here Jon discusses how to create personalised business cards using your Trotec Laser speedy 400. 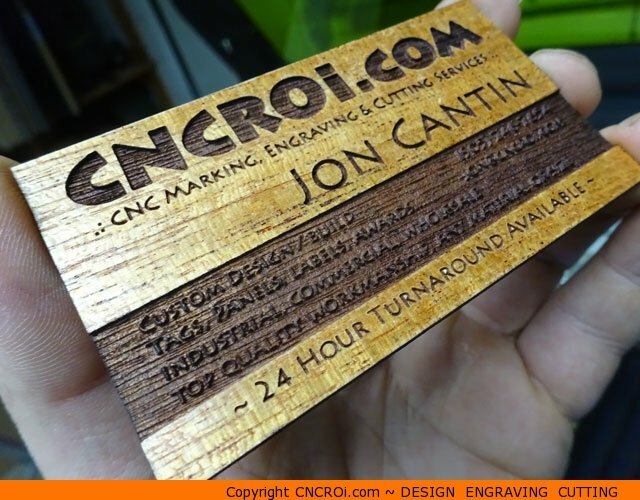 Lots of customers have asked us about custom veneer (wood) business cards, I’m proud to now offer this in our e-commerce system here at CNCROi.com. We’ve got a lot of REAL WOOD options for you when it comes to custom veneer business cards, the results vary based on the density of the material, amount of resin in them and how prone they are to burning which means that no two custom veneer business cards will be the same. We’ve also played around with other materials including cork and various woods made into fabric for some of our clients who were specialized material manufacturers. The masking is applied to the surface to protect it from the resins that are vaporized and settle on the wood after the laser engraving process. As this is real wood, they can also be sanded but we’ve found that with extremely small details like on my business card, masking goes a very long way. Looking at our highly accurate CNC laser engraving process, you can see how mini-explosions of vaporized material happen a fraction of an inch above the veneer surface. In this case, it’s a mix of protective paper and surface veneer. That red blur you see is our Austrian CNC laser moving so fast that it’s breaking land speed records getting this custom veneer business card done! The setting on this business card *should* be further optimized for veneer but I left everything as/is to show you what happens if you don’t. Prime example is the small reverse-engraved writing in the black area of my business card. That would need to be thickened-up in order to leave enough contrasting surface to be more easily legible. Here’s what the same card looks like compared to what you get out of a stamp where you have the opposite issue, the small writing (again, not optimized on purpose) is harder to see while the black part is clearly legible. Alright, back to making awesome custom veneer business cards! After the engraving process, we cut out the business card. Now you can see why we can offer custom engraving of literally anything and cut out an outline just as custom. The entire process is done by our wide-format industrial CNC laser! The results are looking pretty nasty eh? Well, that’s why we use the masking in the first place, all that soot and resin is stuck to the wrapping, not the underlying veneer! Taking a look at the card a little closer, you can see how the inside part is clearly legible but could be made a bit better, you can also see the grain in the card and small parts that are a fraction of a mm in thickness inside the black part. If that was thickened-up slightly, it would be easier to read. You can see the depth on the card, this gives it the feel that you’d expect, we can go as shallow or deep as you wish, generally, we just go a little into the card to not damage its strength. This is 1/8th inch or 3 mm thick wood veneer, not stainless steel or anodized aluminium! This is why each custom veneer business card is so unique, the wood grain and all the little details that go into a once-alive product really give it quite a bit of distinction. Taking a look at the card straight-on, even with the fault, it still looks way better than something that was printed, the depth, the permanency of the material and natural shine make this card stand-out at any client meeting or networking event! 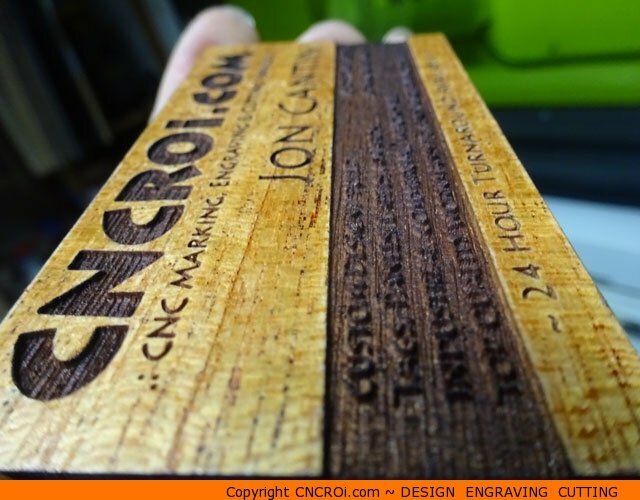 So, how do you go about getting your very own custom veneer business cards? Contact CNCROi.com and we’ll get the ball rolling with you. You will need to send us an EPS of your current business card which we will optimize a little based on the base material. A common question I get is that these cards are expensive, yes they are, which is why you need to get clients who earned them! Going to networking events, hand-out the regular cheap paper ones but clients who you wish to gain attention from, give them something UNIQUE.